Want to stay up to date? Sign up for our mailing list and follow us on Facebook. Pilot Hill Contract Deadline Extended! As part of the contract extension, Warren Livestock has offered several opportunities over the coming months to open the property for community members to tour the Pilot Hill parcel and help plan the future park. The Pilot Hill Days will give everyone who comes out a chance to experience the topography and learn more about the aquifer recharge process, wildlife habitat needs and historic preservation opportunities. It will also provide great opportunities for the Pilot Hill committees to gather feedback on recreation trail systems, access sites and other potential park amenities. Details to be announced soon! Sorry for the radio silence over the past month! We’ve been busy behind the scenes moving our data into new software. We have a prize for anyone who helps us catch any errors in our updated donor recognition list! If you spot something that needs to be fixed, send us an email at pilothillproject@gmail.com. Be sure to include your name, snail-mail address and phone number and we’ll send you a token of our thanks! Happy New Year! THANKS to all of you who have helped move the Pilot Hill Project forward! Acknowledging tremendous community support, the one-year Pilot Hill sale/purchase agreement was granted a 6-month extension. The Wyoming Community Foundation joined as one of the many project partners ensuring all donations qualify as a charitable contribution for tax purposes. The proposal for a State Lands Exchange to help with the purchase is looking bright! You will soon see a link to the detailed report of the proposal and ways to provide comments. The results of the Community Survey, State Archeologist Inventory, sensitive aquifer recharge areas and wildlife habitat data will inform the Land Management Committee’s work to plan access sites, trail systems and park management. Pledges and donations will be invested in the purchase, initial infrastructure and park management, and leveraged to secure additional donations, grants and investments. Volunteers will be invited to “lend a hand” on Pilot Hill and on planning a community celebration in the coming year! December 7: Thanks to all you elves who made it out to the Laramie Christmas Parade tonight! Our float was an Airstream trailer decorated with seasonal cheer, and a reminder to “get your elf off the shelf and play outside!” It’s part of what makes winter a great time of year in Albany County. Great news! The Pilot Hill purchase agreement has been extended. October 10: The Pints & Pretzels fundraiser and auction was a great success and has helped secured another acre of the Pilot Hill parcels. Please stop by and thank John and Jodi Guerin at Coal Creek, and the following auction donors for their tremendous support. NU2U Street Dance raises two acres! September 21: We are raising a toast and sending our thanks to the great team at NU2U for donating the proceeds of the 2018 NU2U Street Dance and Costume Party to the Pilot Hill Project! An additional two acres of the Pilot Hill property have been supported through their generosity. September 21: Several UW Faculty Senate members are starting out the school year with an invitation to UW employees to send a message of collective support for the Pilot Hill project by challenging every department, unit and division to collectively support an acre or more. The goal is to gather pledges for over 50 acres. This collaborative effort encourages colleagues to work together and is intended to generate some good-natured competition between departments and units to see who can support the most acres. Check out the Cowboys Need More Open Space page on our website to watch the UW challenge unfold – and if you work at UW – join in the fun by inviting your colleagues to get involved! Need a pledge form? Download it here. 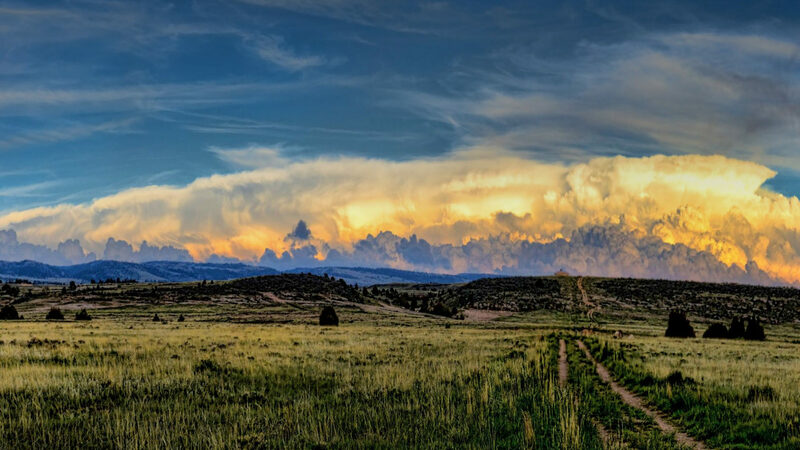 August 29, 2018: Trihydro Corporation recently announced a significant combined corporate and employee pledge in support of the Pilot Hill Project, an effort to purchase 5,500 acres of private land adjacent to Laramie. The support includes an outright cash gift, in-kind engineering services and dollar-for-dollar matching funds to support employee contributions, which have surpassed $25,000. Sen. Chris Rothfuss, chairman of the Pilot Hill Project Oversite Committee, thanked Trihydro for its support. With headquarters in Laramie, Trihydro has more than 400 employees at 21 offices around the country. The company provides engineering and environmental consulting services, with a commitment to employees, clients, social responsibility, sustainability and community. To initiate the Pilot Hill Project, the Albany County Commission signed a purchase agreement last fall approving the purchase of the nearly 5,500 acres of private land east of Laramie, with the price set at $10.5 million following an appraisal earlier this year. The parcel stretches from the eastern edge of Laramie to the Pole Mountain Unit of the Medicine Bow National Forest, and from near Pilot Hill south to Interstate 80. All the Pilot Hill property overlies the Casper Aquifer recharge zone, which is a major source of Laramie’s drinking water. The Wyoming Office of State Lands and Investments is currently researching a potential land swap to help acquire some or all the acreage in exchange for landlocked parcels elsewhere in the county. Meanwhile, the Pilot Hill Project committee has been collecting pledges and donations to support the purchase. In addition to the purchase price, an estimated $4.5 million will be needed to build and maintain infrastructure to allow public access, such as parking lots and trails. A pledge agreement is available online at PilotHill.org/make-a-pledge. A public survey is also available at the Pilot Hill website. Results will be used by the committee to guide future management of the parcel. August 20, 2018: NU2U will be generously designating PHP as the beneficiary of their 7th annual costume party and street dance! Join in on the fun, purchase a newly-designed Pilot Hill Project pint-glass full of your favorite malt beverage, wear a costume, and enjoy live music. September 7th at 5pm in downtown Laramie. August 20, 2018: We’d like to give a huge shout out to Digital Blues Print Shop for being a critical in-kind partner to the Pilot Hill Project. Digital Blues has donated over an acre’s worth of support by being our on-call printer for posters, signs, brochures and pledge agreements for the Pilot Hill Project. Please consider stopping in and saying hi and thank you to Kevin and Brett, who have been such great partners for us. Digital Blues Print Shop is located at 214 Grand Avenue. Many, many thanks to our volunteers! August 20, 2018: Have you seen us at a Farmer’s Market or tabling an event this summer? We couldn’t do it without our volunteers. Thanks much to all… you know who you are! If you haven’t, and you want more information or have questions, visit us at one of the upcoming Friday Farmer’s Markets in downtown Laramie. The Office of the Wyoming State Archaeologist completed the cultural resources pedestrian survey on the Pilot Hill property May 14 – June 8, 2018. The Office is currently recording all of the identified sites and isolates, and anticipates finishing this process before the snow flies. July 30, 2018: To date, 247 community members have participated in the Pilot Hill Project Survey. The results will guide the PHP Committees as we plan for the management and future public access and use. We need your input too! Please take a few minutes to complete the survey. July 13, 2018: Thanks to the Pedal House for hosting the Pints for Pledges event and to the tremendous community of supporters who joined in this celebration. Over $40K was raised during the event. Thanks to everyone who stopped to visit the Pilot Hill volunteers at Freedom Has a Birthday. Over $15K was pledged toward the land purchase, development and ongoing management. Almost $100,000 in pledges and donations were submitted last week, making it one of the best yet for fundraising. June 29, 2018: We’ve had a record setting week for pledges and fundraising, receiving almost $100,000 last week! Help us set a new record by finding us at the Farmer’s Market and joining us at Pint for Pledges this Friday. Thank you! Grant awarded for resource inventory! Albany County and the Albany County Historic Preservation Board was awarded a Certified Local Government Grant from the Wyoming State Historic Preservation Office in the amount of $7,040 for the purpose of conducting the Pilot Peak Cultural Resource Inventory on the pilot hill property. The Pilot Hill Project Committee needs your help collecting images of the Pilot Hill Project. The price for the Pilot Hill Project has been reduced to $10.5 million following an appraisal. The Albany County Commission signed a purchase agreement in September approving the purchase of about 5,500 acres of private land east of Laramie for $14 million. An appraisal was completed earlier this year, valuing the parcel at $10.5 million, and the purchase price was adjusted to reflect the appraisal. The parcel, which would be open to the public after the purchase, stretches from the eastern edge of Laramie to the Pole Mountain Unit of the Medicine Bow National Forest. It covers a portion of the Casper Aquifer, which is a primary drinking water source for Laramie. A public meeting to discuss the purchase project has been scheduled for March 22 at the Lincoln Community Center, 365 W. Grand. Two sessions are scheduled for 5-7 p.m. and 7-9 p.m. The meetings will be facilitated by the University of Wyoming Ruckelshaus Institute of Environment and Natural Resources, which works with stakeholders to develop shared solutions. The goal of the meetings is to review the project status, answer questions, and seek public input. The Pilot Hill Project Committee is working to raise money for the purchase and develop plans for future management. You can donate to the Pilot Hill Fund at the Wyoming Community Foundation with 100% of your gift going toward purchasing the land. In the event that the purchase does not go through, donations will be used for a permanent fund to support recreation and conservation projects in Albany County. Go to PilotHill.org for more information.